Kytherian Valerios Stais is widely recognised for his efforts as a curator of the National Archaeological Museum in Athens and as the first excavator of the temple of Poseidon at Sounio, Attica, Greece. Even though there are two published biographies of Stais, one appearing after his death 1923 and the other in 1992, the rest of his work on the Antikythera mechanism and the prehistory of Thessaly is largely forgotten today. In this paper, the lifelong achievements of Valerios Stais are presented and a special focus has been given on the importance of his pioneering work on the acropoleis of Sesklo and Dimini and the recognition of the unique technological achievement represented by the Antikythera mechanism. In evaluating Stais’s achievements, we meet a persona with a unique influence on the formation of modern Greek archaeology. The efforts of the pioneers of that era are practically forgotten today. P. Pittakis and his excavations in the Athenian Acropolis, Ap. Phintiklis and A. Rhousopoulos professors of Classics in Athens, A. Rizos Ragkavis and his work on the ancient Greek sculpture are only a few of the significant researchers of the era.2 It should, furthermore, be noted that the difficult political situation of the period, the economic and social problems the new state had to contend with, and the lack of governmental policies concerning archaeological research and heritage management, created a very hostile research environment for archaeologists. The struggle against the trafficking of antiquities and the associated violence were everyday activities of a Greek state archaeologist in the 19th century (Galanakis 2012). The wind of change was felt in the field of Greek archaeology in the early 20th century. Excavations such as Tsountas’s work at Sesklo and Dimini (Tsountas 1908), and Arthur Evans’ excavations at Knossos (Evans 1921) changed the way that the study of Antiquity was perceived in Greece, from a treasure hunting pursuit to a systematic process in order to understand ancient civilizations and their material culture. Valerios Stais must also be included in the same category as the aforementioned pioneers: his largely forgotten achievements form the focus of this article. Valerios Stais’s (Fig. 1) name survives in history particularly because of his work at Sounio, Attica. There Stais excavated the famous temple of Poseidon and supervised the restoration work. Looking a bit deeper into his life and archaeological work, it is noticeable that his research had a broad impact on the formation of Greek and world archaeology. His preliminary work at Sesklo and Dimini opened the path for Tsountas’s excavations, his work on Mycenaean tombs in Kythera helped to understand the expansion of the Mycenaean world and his research on the finds from the Antikythera shipwreck identified the fragments of the Antikythera Mechanism, the ancient world’s most advanced technological instrument. Portrait of young V. Stais (from Petrocheilos 1992). Stais was born on the island of Kythera, Greece in 1857. He was a member of one of the wealthiest and most important families of the island and son of Nikolaos Stais, the doctor of the island’s capital (Stathis 1923). Following his father’s footsteps, Valerios registered to study medicine in the University of Athens in 1877. He stayed only three years in Athens; in 1880 he went to Bonn, Germany in order to enrol in an advanced University (Petrocheilos 1992). In Bonn, Stais met Reinhard Kekulé, professor of Classical Archaeology at the University, and at Kekulé’s invitation Stais started attending his lectures and almost abandoned his study of medicine (Stathis 1923). This created conflict between Stais and his family, since his father wanted his son to follow him in his practice so as to create a lineage of doctors (Petrocheilos 1992). However, the year after (1881) Stais enrolled in the Department of Philosophy at the University of Berlin, starting his archaeological studies. Finally, he received his Doctorate of the University of Halle (Saale) in 1885 (Petrocheilos 1992; Petrakos 1987; Stathis 1923). After the completion of his studies, Stais returned to Greece. In 1885 he was appointed to a position in the Ephorate of Antiquities and in 1886 he became a member of the Archaeological Society (Petrocheilos 1992). Stais’s first work as a state archaeologist was the supervision of P. Kavvadias’s excavations at Epidauros (Stathis 1923). Two years later (1888) he received a transfer to Athens and the Central (now National Archaeological) Museum. He would spend his career as curator and then director of the Museum until his retirement in 1920 (Petrocheilos 1992). During his time at the Museum he studied and published two of its largest collections. In 1907 he published, in French, all the marble and bronze statues of the Museum (Stais 1907) and in 1909 the Mycenaean collection (Stais 1909). It was the first time that these two collections had been catalogued in detail and published with comments and illustrations of the objects. Even today these two volumes are a valuable resource for researchers in the National Archaeological Museum. In 1889, following a governmental order, Stais started systematic research in Attica in order to investigate the significance of the area during the Classical period. His research efforts in Attica led to great discoveries at sites such as Rhamnous, Thorikos, and Sounio as well as the burial mound of the battle of Marathon (Petrocheilos 1992). Today all these places are famous archaeological sites, with thousands of visitors annually (especially the temple at Sounio). 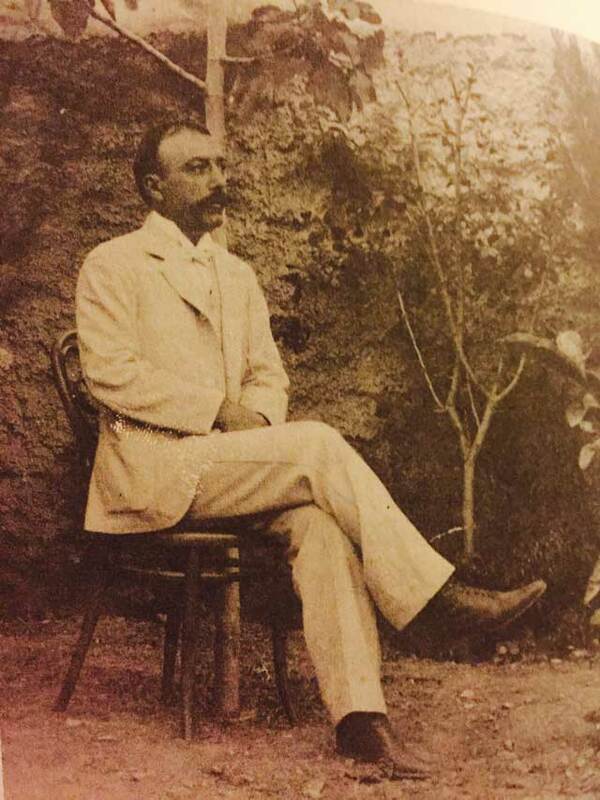 Stais systematically published his research in Greek archaeological journals and in a monograph.3 Stais’s efforts in Attica have been extensively presented by his biographers (Stathis 1923; Petrocheilos 1992). So, why is Stais a forgotten pioneer? Valerios Stais’s investigations in Attica are widely recognised for his systematic methodology and his quick publication of the finds. However, Stais was not the first to identify the importance of Attica for the classical era. He based his work on previous research, such as Schliemann’s at Marathon, and of course on the ancient Greek literary sources such as Pausanias (Stathis 1923). However, Stais’s discoveries were sometimes just based on his instinct and his broader knowledge about the landscape, cultures, and civilisations of the area. In my view this was Stais’s most important contribution to the field of Greek archaeology. These following instances show why he deserves to be recognised as a real pioneer. In 1901 Stais, after a decision of the Central Department of Antiquities, was transferred to Dimini, Magnesia in order to excavate a Mycenaean tomb, which had been discovered in the area (Stathis 1923). Even though he was not a specialist on Mycenaean culture, he was selected to undertake the investigations at Dimini because he was recognised as one of the best excavators of his time. During his work in Dimini, he pointed out the importance of the nearby hill as a place of archaeological interest. After a small-scale excavation, he realised that the proper evaluation of the archaeological significance of the hill was beyond his knowledge and expertise (Stathis 1923). Stais managed to publish the report of his work at Dimini in the same year along with his observations that the remains on Dimini hill preserved evidence of a civilization that predated the Mycenaean period (Stais 1901). In the meantime he was in touch with Christos Tsountas, his colleague in the Archaeological Society. After previous work at Mycenae (Tsountas 1897), Tsountas had been recognised as a specialist in Greek Prehistory. Stais consequently asked his colleague to continue the Dimini excavations (Tsountas 1908). Moreover, Stais informed Tsountas about another hill in the same area, with archaeological interest. This hill, called ‘Kastraki’ by the locals, is the Neolithic settlement now generally known as Sesklo. It is quite important to highlight that almost 30 years before Gordon Childe’s work on cultural groups, Stais had a strong idea about the general context and did not decide to separate the excavations and the finds from the two Neolithic sites in Thessaly. Moreover, he took advantage of his contact with a specialist on this type of settlement in order to hand on the research to an individual better qualified to study and publish it. Stais did not settle on Kythera after the completion of his tertiary education. However, he kept strong contacts with the island, since his sisters and broader family lived there (Stathis 1923). Stais used to visit the island at least once a year but he did not undertake research on the island until just a few years before his retirement. In 19144 a Kytherian farmer, attempting to build a water reservoir in his field, in the area Lionis at Manitochori village, accidentally discovered two tombs. Valerios Stais was informed of the event given his relationship with individuals on the island and in July of the same year, he excavated the first of the two tombs (Stais 1915). The excavation yielded remarkable finds of the Late Bronze Age, which are now on display at the National Archaeological Museum, along with the finds of the Paleopolis, Kastri excavations (Petrocheilos 1980). The excavated tombs are typical Mycenaean chamber tombs, with a sloping ‘dromos’ leading to the entrance. The main area consists of three chambers, one central and two smaller ones on either side, with a maximum height of two meters. In the central chamber, two skeletons were excavated, both placed in a foetal position. In the two smaller compartments were scattered bones and blood vessels, leading Stais to believe that this area was designated for secondary burials (Stais 1915). The pottery of the tomb dates to Late Minoan IB (LM IB) and the Late Bronze II-III (LHII-III). LM vessels from Crete were identified along with LH Mycenaean pottery sherds. This coexistence of different ceramic types derived from different regions and evidencing different cultural traditions, is an interesting case, which demonstrates the important role of Kythera’s position in the study of the period’s inter-regional cultural contacts. Besides the usual vessels of the time (cups, jugs) in the Lionis tomb, Stais also discovered two ‘pithamphoriskoi’: an ‘askos’ with painted decoration and a steatite ‘pyxis’. The high quality of the pottery indicated the status of the people who were buried in Lionis and provided some idea about Kytherian society of the time (Stais 1915). It is remarkable that Stais, in the publication of the excavations at Lionis, mentioned the potential importance that Kythera had for study of trade and communication in the prehistoric Aegean. His ideas would be developed almost 60 years later after Coldstream and Huxley’s excavations at Kastri, Kythera, and the publications of their finds (Coldstream and Huxley 1972). Beyond his research efforts in Attica, Thessaly and Kythera, Stais’s most exceptional and pioneering work was his research on Antikythera. Antikythera is a small island (20 km2) approximately midway between Kythera and Crete. Today it is only inhabited by around 44 people (Tsaravopoulos 2013). In 1899, Stais was informed of the discovery of a broken marble statue in a field near Potamos, the main settlement of the tiny island (Petrocheilos 1992). During the summer of 1899, Stais excavated the area in which the statue had been found and discovered the base with the dedicatory inscription ‘Αἰγιλιέα Ἀπόλλωνα’ (Apollo Aegilieus) (Tsaravopoulos 2013). Stais published the inscription along with the rest of the finds in the autumn of the same year (Stais 1899). Stais’s idea of the existence of a temple of Apollo on the island was confirmed over 100 years later in 2004 when, during excavations by the Ephorate of Antiquities, foundations of a large temple were discovered near the beach of Xiropotamos (Tsaravopoulos 2013). In the spring of 1900, sponge divers from the island of Syme discovered fragments of bronze and marble statues in the Antikythera Sea. In the beginning of 20th century their island was under Ottoman rule, but the divers still brought the artefacts to Athens and to the National Archaeological Museum (Stais 1905). Immediately, Stais realised the importance of the artefacts and along with the divers he organised a visit to his cousin Spyridon Stais, who was the minister of Education at that time (Price and De Sola 1975).5 Spyridon Stais’s enthusiasm led to the organization of the first marine archaeological expedition in world archaeology, in Antikythera, during the winter of 1900–1901 (Price and De Sola 1975). Extraordinary finds were discovered during that expedition, including bronze and marble statues, pottery and glass vessels. The underwater excavations were initially supervised by the General Director of Antiquities G. Byzantinos, but K. Kourouniotis took over from Byzantinos after the first few months of operations (Petrocheilos 1992). Stais stayed initially in Athens, and travelled to Antikythera by the end of the first expedition, in order to investigate the opportunities for a second season of research. The casualties of the first expedition (one diver died and two more were paralysed) and its extremely high cost led at the time to the decision not to undertake any other research attempts. Nonetheless, Stais returned to Antikythera during the autumn of 1905 with a few divers. As we can read in the Newspaper ‘Neon Asty’ (24/12/1905), Stais stayed on Antikythera for 37 days. The extreme weather cancelled the arrival of the navy vessel and prevented the divers from conducting any work. Ἐπανῆλθεν ἐξ Ἀντικυθήρων ὁ ἔφορος τῶν ἀρχαιοτήτων κ. Στάης, ὅστις εἶχε σταλῆ ἐκεῖ διὰ τὰς ἐργασίας πρὸς ἀνέλκυσιν τῶν ἐναλίων ἀρχαιοτήτων. […]Ἐπὶ 37 ὁλοκλήρους ἡµέρας ἦσαν ἀποκεκλεισµένοι εἰς τὸ ἔλεος τοῦ Θεοῦ, µαταίως ἀνάπτοντες πυρὰς ὅπως εἰδοποιηθῇ καὶ διέλθῃ κανὲν πλοῖον καὶ τοὺς παραλάβῃ. Οὕτω καὶ αἱ ἀρχαιολογικαὶ ἔρευναι ἀπέβησαν µάταιαι […]. Inspector of Antiquities Stais returned to Antikythera in order to continue the search for the underwater antiquities. The finds retrieved from the wreck during the first season arrived in the National Archaeological Museum in Athens in the beginning of the summer of 1901. Immediately several reports were published in the Greek press (Weinberg et al. 1965). However, the first person who tried to date the wreck and its finds was N. Svoronos in 1903. Svoronos dated the wreck to the end of the 4th century BC (Weinberg et al. 1965). In the meantime, on the 20th of May 1902, Spyridon Stais visited the National Archaeological Museum in order to check on the progress of the finds’ processing and during his visit spotted in a box a bronze fragment with gears (Fragou 2010). The Antikythera mechanism had officially been discovered. The newspapers of the era presented Spyridon Stais as the person who realised the existence of the mechanism and not his cousin Valerios, and this is the view still held today (Fragou 2010). However, in the newspapers (‘Skrip’, 22/05/1902 and Estia, 22/05/1902), it is clearly stated that Spyridon Stais examined the gears on the fragment in collaboration with the archaeologist (Director) of the Museum (‘… παρα τω αρχαιολόγω..’), his cousin Valerios. Spyridon Stais had lost his position in the government in November 1901: perhaps he presented the discovery of the mechanism as a personal achievement in order to enhance his political importance. The manner in which he organised the announcement of the Mechanism’s discovery, with a press conference (‘Skrip’, 22/05/1902), supports this theory. It is difficult to evaluate the work of a person who worked almost 100 years before one’s own time. The research objectives and aims were different and archaeology was still more art history than anthropological investigation. Stais, though, seemed to approach his research in an innovative way: he understood the concept of collaborative research, working with specialists, as the method that he utilised for the research of the Antikythera Mechanism demonstrates. He understood concepts such as ‘cultural groups’, ‘context’ and ‘mobility networks’ even if he did not name them as such. The most impressive element about Stais’s work is the way that he analysed, published and discussed his finds. His publication list comprises four monographs, 40 excavation reports and 24 research papers in relevant journals. This proves that Stais not only published excavation finds rapidly but also that he studied his material, analysed the evidence, collaborated with ‘specialists’ and finally presented his results. The observation that best summarises the novel concept that Stais had about archaeology is that he even wrote a paper about the history of Wilhelm Dörpfeld’s archaeological research at Tiryns and Troy (Stais 1913)! Stais died in Athens in 1923 at the age of 66 (Petrocheilos 1992). His contribution to archaeological research was recognised by the Greek, German and Austro-Hungarian states. He received honours from King George of Greece, Kaiser Friedrich Wilhelm of Germany and Emperor Franz Joseph of Austria (Stathis 1923; Petrocheilos 1992). Stais mainly published his research in Greek. If he had published in another European language instead (he was fluent in German and French), his methodological novelties might have influenced more people and accelerated the emergence of modern archaeological practices. 1For further history of the archaeological Society see: http://www.archetai.gr/site/content.php?sel=24 (accessed 4/3/2015). 2For more about the personalities in the 19th century Greece see: http://www.archetai.gr/site/content.php?sel=26 (accessed 4/3/2015). 3For the Sounio monograph: Stais, V. 1920. Sounio and the temples of Poseidon and Athena. Athens: Archaeological Society (in Greek). 4Stais retired in 1921 in the age of 64 (Stathis 1923). 5Their fathers Emmanouel and Nikolaos were brothers. 6On K. Rados and Periklis Rediadis: http://www.antikythera-mechanism.gr/history/people (accessed 8/3/2015). I would like to thank Eleni Harou, for the inspiration and her tireless assistance during the research for this publication. I would also like to thank Katie O’Connell for her comments during the editing of this paper. Coldstream, J N and Huxley, G L eds. (1972). Kythera: Excavations and Studies. London: Faber. Evans, A (1921). The Palace of Minos. London: Macmillan. Fragou, V (2010). O michanismos ton Antikythiron. Istoriki Anadromi kai Astronomikes Proektaseis, Available at: http://invenio.lib.auth.gr/record/122865/files/ptuxiaki.pdf?version=1 (accessed 9/3/2015). Galanakis, Y (2012). Guns, Drugs, and the trafficking of Antiquities. Archaeology in 19th century Greece. Center of Hellenic Studies Research Bulletin, Available at http://wp.chs.harvard.edu/chs-fellows/2012/10/17/guns-drugs-and-the-trafficking-of-antiquities-archaeology-in-19th-century-greece/ (accessed 4/3/2015). Petrakos, V Ch . (1987). Athens Archaeological Society. The history of 150 years. 1837–1987. Athens: Archaeological Society. Petrocheilos, Io . (1980). Ta Kythera apo tin Proistoriki epochi os tin Romeokratia. Ioannnina: Dodoni. Petrocheilos, Io . (1992). Valerios N. Stais. Athens: Archaeological Society. Price, D and De Solla, J (1975). Gears from the Greeks: the Antikythera mechanism: a calendar computer from ca. 80 BC. New York: Science History Publications. Stais, V (1899). Anaskafai en Antikythera. Archaeologikon Deltion 5: 232–242. Stais, V (1901). Ai en Dimini (Thessaly) anaskafai In: PAE, 1901pp. 37–40. Stais, V (1913). Η υπερτριακονταετής δράσις του Δαιρπφελδ εν Ελλάδι over 30 years of Dörpfeld’s research in Greece. Mitteilungen des Deutschen Archäologischen Instituts, Athenische Abteilung 38: 1. Stais, V (1915). Anaskafai en Kythiris. Archaeologikon Deltion 1: 191–194. Tsaravopoulos, A (2013). Antikythera, History and Antiquities. Available at: http://www.archaiologia.gr/blog/2013/06/24/ (accessed 3/3/2015). Tsountas, Ch . (1908). Ai Proistorikes Akropolis Diminiou kai Sesklou. Athens: Archaeological Society. Tsountas, Ch; Irving Manatt, J . (1897). The Mycenaean Age: a Study of the Monuments and Culture of Pre-Homeric Greece. Boston: Mifflin and Co..